I know, this looks pretty gross. I made overnight oats the other night, and then in the morning realized I didn't have anything to put in them. 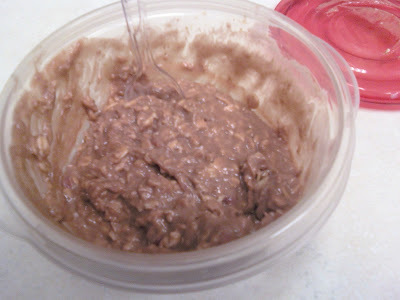 I added a tablespoon of peanut butter and a tablespoon of Nutella, and they were wonderful. Now if I can only remember to make them every night. I have been wanting to try something like this. Now that I have someone's word that it tastes good, I may just do that.